Consultation with Crofters during the ALPS development process revealed that implementation of traditional land management, grassland and habitat improvement projects would not be possible without provision of deer proof fencing aimed at creating a barrier between the hill land and the South Coast crofts where much of the proposed works would take place. Degradation of land has been evident within these crofting townships as the presence of deer has reduced the incentive for active land management. Much of this is identified within the Landscape Character Assessment of the area. As a result of this neglect, land improvement measures were required before appropriate habitat management could take place. It was therefore proposed to provide a deer fence to eliminate deer from croft land, re-condition specific land parcels i.e. liming, draining, ditching, and reseeding, and create new habitats or improce current management. 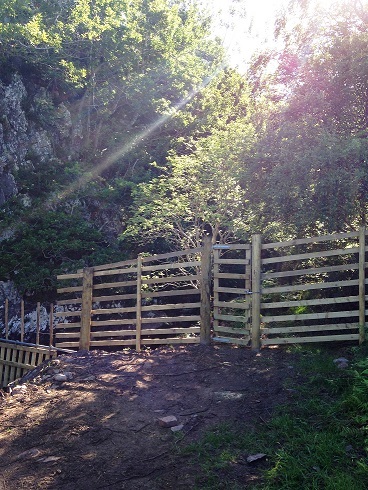 8km of deer fence was installed along the southern end of the Applecross peninsula, including a deer grid at Milltown. This has amounted to a cost of approximately £148,000, funded by HLF, CCAGS and Applecross Trust. The fence is now complete and is the property of both the Applecross Trust and the Crofting Townships of Milltown, Culduie, Camusterrach and Toscaig. A partnership has been established to maintain and monitor the fence line going forward. The result of the deer fence being erected has been substantial already. The crofting townships were previously overrun with deer, eating crops and demolishing gardens. Now, the deer have been excluded from the land and nature is beginning to regenerate.